On the 12th (Sun), admire the landmark architecture of Akal Takht and then get the lay of the land with Walking tours. Here are some ideas for day two: contemplate in the serene atmosphere at Gurudwara Baba Atal Rai, then take in nature's colorful creations at Jallianwala Bagh, then look for gifts at India House, and finally relax and rejuvenate at some of the best spas. To see photos, where to stay, and tourist information, use the Amritsar trip itinerary tool . Chandigarh to Amritsar is an approximately 3.5-hour car ride. You can also take a bus; or take a train. In May, plan for daily highs up to 46°C, and evening lows to 26°C. Wrap up your sightseeing on the 13th (Mon) early enough to travel to Bangkok. Bangkok is known for historic sites, shopping, nightlife, spas, and museums. 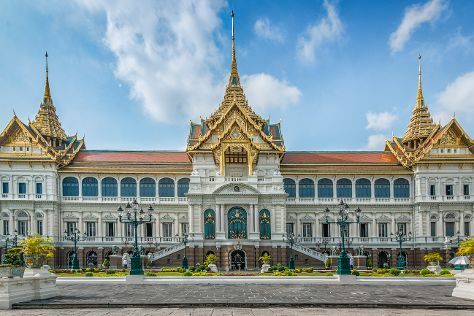 Your plan includes some of its best attractions: indulge in some personalized pampering at some of the best spas, step into the grandiose world of The Grand Palace, don't miss a visit to Wat Pho, and take a stroll through Chinatown - Bangkok. For where to stay, photos, maps, and other tourist information, go to the Bangkok online holiday planner . Getting from Amritsar to Bangkok by flight takes about 7.5 hours. Other options: drive. The time zone changes from India Standard Time to Indochina Time, which is usually a 1 hour difference. Traveling from Amritsar in May, expect nights in Bangkok to be somewhat warmer, around 32°C, while days are slightly colder, around 41°C. Finish your sightseeing early on the 16th (Thu) to allow enough time to travel back home.